It's always much easier to review your betting records after the Cheltenham Festival if you are well in the black, and following a reasonably good week, Paul Nicholls' Pacha Du Polder ensured it would be a great Festival for this corner with a 25/1 win in the Foxhunters. As outlined here, my banker and biggest bet of the week was Footpad in the Arkle, and I was amazed to get him odds-against, although he went off at 5/6. So, a nicely profitable week overall and I hope I don't come across as smug - but regular readers will know that I don't hide away when I have heavy losses either, and you have to take the good with the bad. Lord knows, there's enough losing days in this game, so you've got to sing when you're winning and enjoy it. Anyway, you can be brought down to earth very quickly in betting, and I had a stinker of a day last Saturday with not a single winner from five bets. 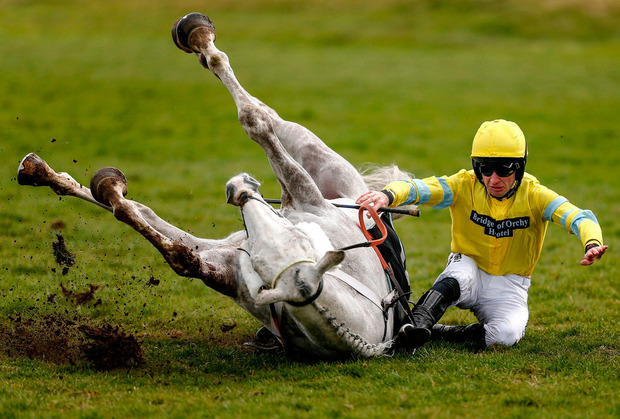 Mistakes Of course, it wasn't all plain sailing at Cheltenham, and mistakes were made which must be used as lessons. I've been put off drinking cider for life having staked far too much on Apple's Jade and Apple's Shakira, beaten at 1/2 and 6/5 respectively, and I also went too heavy on Might Bite when I got caught up in the excitement of the Gold Cup, having previously advised readers to proceed with caution in that race. But it's another year of experience under the belt and we can all take lessons for Cheltenham 2019 by coldly scrutinising our betting records. If, like me, you were burned by the likes of Apple's Jade, spare a thought for backers of Tree Of Liberty at Ludlow on Thursday which was beaten at odds of 1/20 following a number of jumping errors. I read somewhere that it equalled the record held by a horse named Jerry M from 1909 as the lowest-priced beaten favourite over jumps, although on the all-weather Triple Dip was beaten at that price in 2015. With Aintree and Punchestown still to come, we are not done with the jumping game just yet, but we've a change of tone from this week on as the Flat season kicks off at Doncaster. If this were a decade ago, I'd be welcoming the Flat with open arms as my betting records then showed it was far more profitable for me. But that's changed in recent years and I'm either getting better at the jumps, or worse at the Flat. I'm not quite sure which, but I no longer show such a disparity comparing betting records from both codes. Overall, punters seem to perform marginally better against the bookmakers in jumps racing if we use the return on investment (ROI) on the favourite as a guide, although when it comes to the top-class races (Group One or Grade One), Flat backers fare out best. Since 2008, blindly backing the favourite in Grade One jump races has produced 298 wins from 657 bets and a loss of 5pts to SP, a ROI figure just about in the red. But in Group One Flat races, there were 186 winners from 434 bets and a profit of nearly 6pts; a ROI of 1.29pc. That's a good starting point in itself for the big races and with some selectivity and form study, it's not impossible to make a good return. Of course, handicaps are a different matter entirely and today's Lincoln at Doncaster looks quite the puzzle - but priced 16/1 in the early markets yesterday, I've settled on Donncha. Third in this to Bravery last year off a mark of 100, his form has been up and down since, but the handicapper has cut him a bit of slack and he's 3lbs lighter today on 97 for a racing weight of nine stone. He was second in this race off that rating in 2016 which gives me hope, although I do concede things may be more difficult today at the age of seven. Trained by Robert Eddery, he's obviously been prepared with this race in mind again, and he's recently gelded which may make a difference. It's not a race for heavy punting but on balance, I reckon those odds are fair. Andrea Atzeni takes the reins and it will be interesting to see if the now-usual hold-up tactics are employed. Earlier in his career, Donncha has gone well when given a prominent ride and I'd like to see Atzeni get him out early into a front running-position for a change, to see if it makes any difference. Serious Fire Brigade put in some fine displays last autumn, finishing off the season with a win in a good-quality handicap at Leicester and has serious claims - although a price of 11/2 looks a little short in such an open race. In the Spring Mile (2.25), Sir Roderick gets the nod around 14/1. Trained by Rod Millman, he's racing for the first time since a wind operation, and although a little disappointing in his last few races, his mark has dropped to a realistic 81, down significantly from the mid 90s rating this time last year. It's not all about the Flat today, and Henry Daly's mare Black Tulip makes appeal in the Grade Two Ebf & Tba Mares' "National Hunt" Novices' Hurdle Finale at Newbury (3.15). I'm surprised to see her priced as high as 25/1 in the early markets, considering she put in a solid display to make up ground late, and win a novice hurdle at Warwick in tough conditions in December. Perhaps punters are put off by her latest race at Doncaster in which she struggled under a penalty, finishing 10th of 16 runners, but that came very soon after Warwick and she appeared a little tired. A break of 74 days will have freshened her up and she can go better than those odds suggest. Soccer: With the Premier League off due to international friendlies, Wigan to beat Bury looks the football banker of the weekend in League One, priced around 8/11. Under the guidance of Paul Cook, Wigan look certain to return to the top flight, while at the other end, Bury look sure to be relegated having won just one of their last seven league games. Racing: Trained by Richard Hannon, Tabarrak should prove difficult to beat at odds of 2/1 or thereabouts in the Listed Unibet Doncaster Mile Stakes (3.0). Hannon knows the sort it takes to win this and claimed the honours last year with Kool Kompany, and the selection is very consistent, finishing a respectable second in a Group Three last term. He was last seen when winning at this level in September, and should have more to come.